*NOTE* When purchasing the download version, the booklet will be sent separately in PDF form via email within 24 hours of the transaction. 100 Key Points is a list of spiritually significant truths paramount to the Discipleship Program. These points are core beliefs that we believe every believer should have written on their hearts so that their thoughts, words, and actions are a reflection of these truths. (Out of the abundance of the heart the mouth speaks). 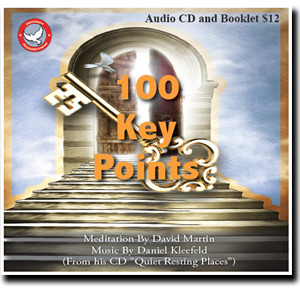 This peaceful reading of the Discipleship’s Program list of 100 Key Points by David is designed to help you renew your mind through repetition (meditate on the Word day and night). Terms of Service Copyright © 2019 David Martin Ministries All Rights Reserved.